Did you know that even though Georgia calls itself the Peach State, South Carolina actually leads our neighbor in peach production? In fact, we lead all other states in the country except California. The delectable treat became the official state fruit of South Carolina in 1984 and has earned its place at the table, so to speak, with an annual harvest of over 90,000 tons. How ’bout them apples … er, peaches? 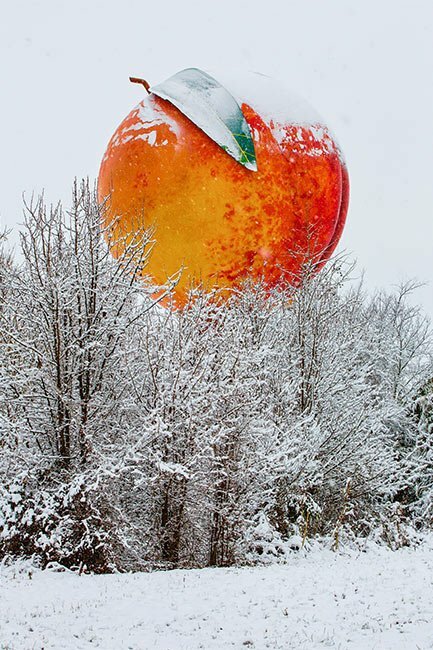 The Peachoid, Gaffney‘s famous roadside attraction pictured below, depicts South Carolina’s sweetest bumper crop. 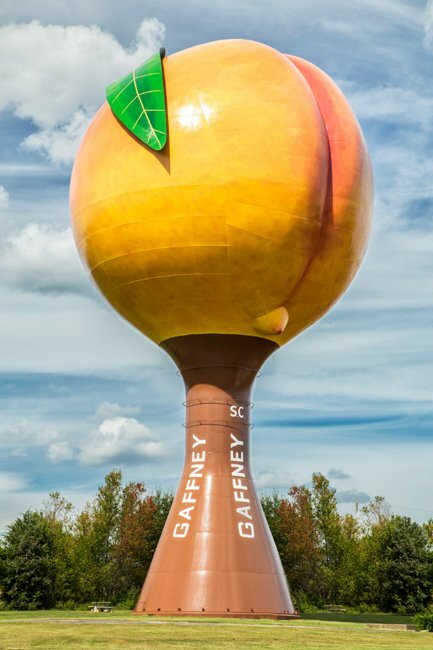 The idea of the Peachoid came to Gaffney Board of Public Works member Jack Millwood when it was decided that an elevated water tower was needed for the area. 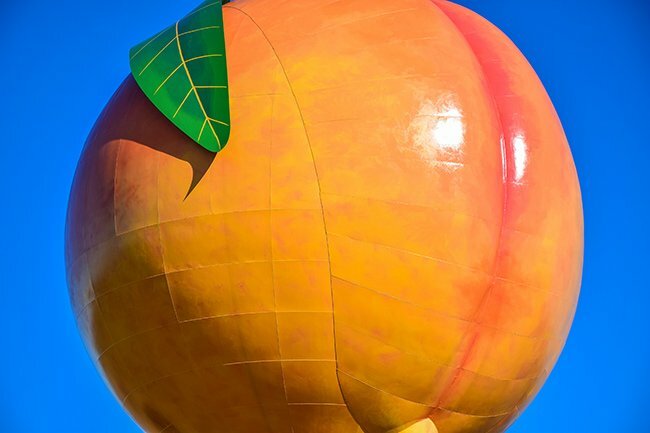 His famous words – “Let’s build it in the shape of a peach!” – are immortalized in the enormous depiction of the pitted fruit that looms over I-85. Built in 1981 over a period of five months, the iconic water tower features a cleft, a stem, and a seven-ton peach leaf. It holds one million gallons of water and can be seen between exits 90 and 92 off I-85. Made to highlight the region’s favorite crop, the Peachoid’s colors are meant to reflect the varieties of peaches grown in the area. After the basic colors were applied to the tower’s various parts, original artist Peter Freudenberg used 50 gallons of paint and more than 20 colors to achieve the desired effect, seen in the photo immediately above. In 2015 mural artist Eric Henn of Ohio repainted the towering peach to give it a much-needed makeover, particularly now that the icon is prominently featured on the Netflix series, House of Cards. The results can be seen in the photo above. Learn more about South Carolina’s state fruit – the peach! Was looking for where I could find some me some peaches now, Nov. Got to this info about our state fruit & really learn a lot. What a beautiful southern peach & now I am really ready to eat … some juicy peaches … can hardly wait! I knew Peter Freudenberg, he was my Grandmother's neighbor's son. I bet this is the prettiest water tower in the whole country! I love it!